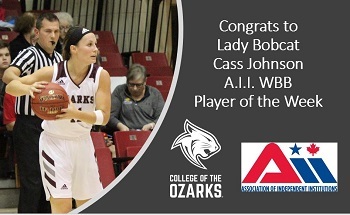 College of the Ozarks’ Lady Bobcat Cassidy Johnson has been named as the Association of Independent Institutions’ Women’s Basketball Player of the Week. Johnson averaged 16.3 points and 5.3 rebounds over a three-game stretch last week, including 18 points and seven rebounds in a 66-57 home victory against NAIA Division I John Brown University (Ark.). She was one of six Lady Bobcats in double figures, with 17 points, in a 102-39 victory at Fisk University (Tenn.) last Friday and added 14 points the next day in an 89-29 win at Welch College (Tenn.). On the season, Johnson leads her team in scoring, averaging 19 points per game on a team which boasts four players averaging double figures. She is shooting 54.2% from the field and has tallied 36 three-point shots to date.